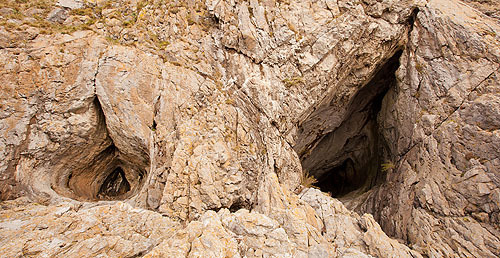 Paviland Cave (Goats Hole Cave) is a 22m long passage , 10m high at the entrance , tapering to the rear , max width 6m. The remains - "The Red Lady of Paviland" - discovered by Dean William Buckland (Professor of Geology at Oxford) in 1823 , consisted of an adult headless skeleton that had been dyed with red ochre and buried with goods made from bone, antler and ivory. Perforated seashell necklaces with the body led Buckland into identifying the skeleton as that of a female. A large Mammoth's skull, was also uncovered at the site , indicating a possible ritual burial. In 1912 the skeleton was identified as a male and dated to around the Stone Age. In 2008, radiocarbon dating gave a date of about 34,000 years . The 'Bone Caves' have proved a rich source of human and animal remains and artefacts.